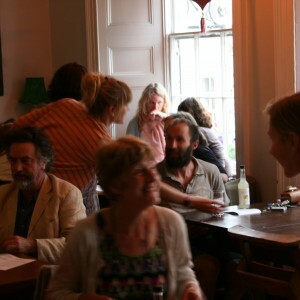 Telltales celebrated its tenth anniversary on Tuesday, 31 July, at Dolly’s Wine Bar, with balloons and bubbly contributing to the festive atmosphere. We had Telltales’ signature mix of established and new writers, poetry and prose, including Kelly Stevens, Aimee Alibiston, Lally MacBeth, Samuel Fletcher-Wilson, Rosanna Smith and Too Long Dead. Clare Howdle, co-founder of Telltales, both read her own new work and looked back at its ten years of “encouraging and showcasing writers”. We’ll be taking a break now. Please check back to see what happens next!